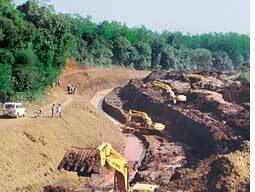 KARNATAKA has finished digging a canal for diverting water from a tributary of Goa's lifeline, Mhadei. The Goa government had filed a case in the Supreme Court in 2006 for staying the canal work because the Mhadei, known as Mandovi in Goa, meets a major part of the state's drinking water and irrigation needs. The canal will divert water from Kalsa nala to the Malaprabha river under the Kalsa-Bhandura irrigation project that, environmentalists say, violates forest and wildlife laws. "During my recent (mid-December 2008) visit to the area, the project's site engineer informed me that the excavation work for the canal was complete and within 15 days work on covering it with concrete would begin. If this project is not stopped immediately, the water of Kalsa nullah will flow eastward rather than flowing westward towards Goa in the monsoon," warned Shrihari Kugaji, an environmentalist in Belgaum district of Karnataka. Goa has over 70 per cent of the Mhadei's basin and its Mhadei wildlife sanctuary is dependent on the river. The Karnataka forest department is helping Karnataka Neeravari Nigam Ltd complete the project; the company carries out the state's irrigation work. Digging was done in both forest and non-forest areas without the permission of the Union environment ministry. An official of the Kankumbhi forest range, through which the canal passes, filed an fir on the violation on November 8, 2008, but no action followed. Officials of the Karnataka forest department admit they are under tremendous pressure to ignore such violations and assist the irrigation department. The excavated soil is being spread in the reserved forest and exotic species are being planted on it. Nirmala Sawant, president of the Goa-based non-profit Mhadei Bachao Abhiyan, filed an interlocutory application in the Supreme Court in April 2006. This was followed by applications before the apex court's Central Empowered Committee (cec) that monitors forest-related cases. But both the court and the committee did not give any directions on the matter thus giving time for Karnataka to go ahead with the project. Though the cec issued a notice to the Karnataka government in September 2008, asking whether the irrigation project violated the forest and wildlife acts, the state continued with the canal work. "For over two years we kept the court informed about the progress on the project, but it did not take us seriously. In 2007, when we informed it that the irrigation department had deployed machinery at the site, the court said bringing machinery did not mean work would begin. But look at the situation now. We have caught Karnataka red-handed. We will file a contempt petition in the court when it reopens in January," said Sawant. Kugaji alleged Karnataka had purposely hastened the work during the court holiday so that it could plead fait accompli. Kugaji had in October 2006 filed a petition before the cec alleging Karnataka was flouting the Forest Conservation Act, 1980, that states: "If a project involves forest as well as non-forest land, work should not be started on non-forest land till approval by the Central government for the release of forest land." Sushant Naik, a farmer-environmentalist in Goa, also approached the cec in October 2008, alleging the project violated Section 29 of the Wildlife (Protection) Act, 1972, that prohibits stopping water flow to a sanctuary. "I have been working in Mhadei sanctuary for five years. It has more than 180 species of birds, of which seven are endemic. If Karnataka diverts the Mhadei's water, this wildlife sanctuary will not survive," said Pankaj Lad, member of non-profit Vivekanand Environment Awareness Brigade in Goa who also filed an application with the cec against the project in November 2008. Kugaji said the cec should have visited the project site and informed the Supreme Court. "The court does not understand the nitty-gritty of forest matters and works on the faith of this expert committee. It should have guided the apex court," he said. M K Jiwrajka, member secretary of the cec, was unavailable for comment. Goa has sent a fact-finding team to Karnataka to prepare a report for the apex court. It wants that a water tribunal be set up to sort out the matter.